Do you love the inexpensive functionality, durability and ‘tacticool’ of nylon, Perlon, rubber or leather NATO straps? Or will you forever argue that this is the watch band that cheapens luxury watches and their wearers? One thing everyone seems to agree on is that what so many people now call the NATO strap, with its long nylon band running behind the watch case, its buckle and keepers (the metal or fabric loops for securing the strap end), was born in the early 1970s. Before 1973, British forces had other standards for straps issued to service personnel. An article titled ‘The NATO Strap’ in Issue 15 of Omega’s Lifestyle customer magazine gives useful commentary on the origins of the modern NATO watch strap. 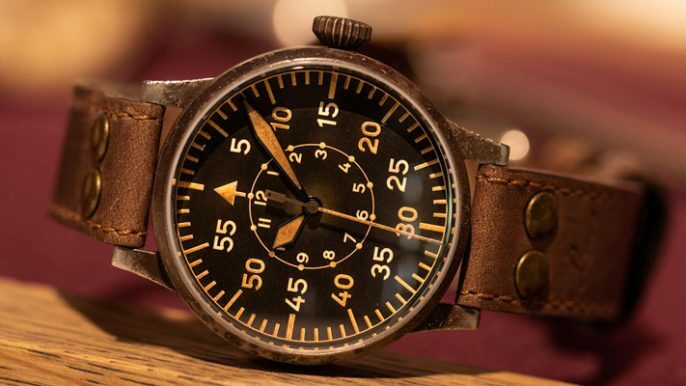 According to the piece, ‘[the strap’s] origins lie with the one-piece canvas straps used by British pilots, navigators and army personnel in WWII’. The article goes on to say that, ‘to make the war-zone watches more robust, suppliers…replaced spring-loaded bar strap attachments on the lugs with fixed bars…this more durable option meant that the one-piece strap needed to be threaded through the bars.’ According to the article, a single length of 16 mm tropicalised webbing became the standard UK military strap for over 25 years. During WWII it was the Army Trade Pattern (ATP) spec. Afterwards, ‘military standard’ meant British War Office Specification RS/Prov/4373A (‘Watches, Wristlet, Waterproof’) until 1973’s Ministry of Defence Standard (DefStan) 66-15 for a ‘Strap, Wrist Watch’ was published and NATO straps were born. The unofficial descriptor ‘NATO Strap’ comes from the strap’s NATO Stocking Number (NSN). According to DEF STAN 66-47, there are two versions, one for the Army and Navy (6645-99-124-2986) and one for RAF use (6645-99-527-7059). Purists, usually with the authority and credibility of military backgrounds, argue robustly that NATO straps should correctly be called G10 straps, after the military G1098 quartermaster’s store (‘G10’ for short, or ‘G10 for men’ according to one ex-Army contact) that issues them. The latest version of the standard was DEF STAN 66-47 in 2001 (withdrawn 8 November 2013). According to UK Defence Standardization in Glasgow, UK, when we contacted them in March 2016, there is no replacement or superseding Standard and therefore no revision. How G10/NATO straps are currently specified remains unclear… Correspondence with the helpful team at Defence Standardization elicited a response that ‘there may indeed be another specification that the procurer may well use to specify minimum quality requirements and/or dimensions, however it is not a Defence Standard.’ UK Defence Standardization couldn’t give us any further information. Further online research reveals reference (on a 2007 forum post) to there no longer being a standard G10 [watchband] other than the fabric type. And that this is now 18 mm because the military reinstated CWC G10 watches with 18 mm lugs instead of earlier watches with 20 mm lugs. 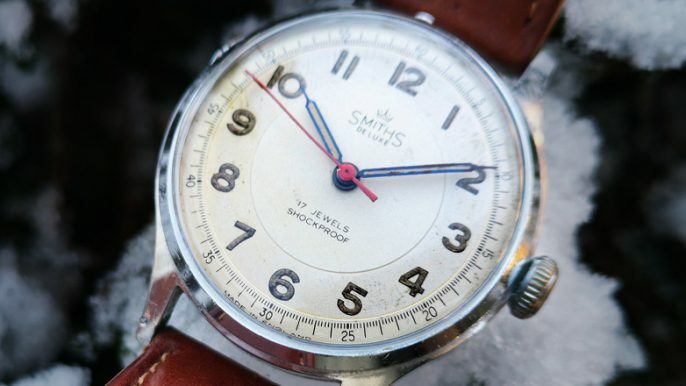 Do you know the definitive answer to the mystery of the disappearing British military watchband standard? If so, we’d love to hear from you. Material: straight cross-weave nylon ribbon free from additives that could irritate the wrist under humid or extreme conditions. Colour: BS 4800 card number 3, reference 18B25, colour grey. (‘Admiralty grey’). Width: 20 mm (± 0.5). Welded joints and sealed strap end. Loops at 12 mm, 37 mm and 87 mm from the buckle end). Buckle, prong and keepers of chromium plated brass. Recessed buckle to secure prong. A key characteristic of genuine ‘functional and fail-safe’ military 2-piece NATO straps is a shorter secondary length of nylon attached to the buckle. For extra security in case an attaching bar breaks, the watchband passes under the watch case. The extra nylon ribbon also has a second keeper at its end. When worn correctly, this limits movement of the watch on the wrist. For sure, knowing how to fit your NATO watchstrap is vital to get the best performance from the band. Although a strap width of 20 mm was originally specified, bands inspired by the military versions now come in 18, 20, 22 and 24 mm sizes to match modern lug widths. Indeed, official G10 watches by CWC now come with 18 mm G10 straps to match the lug width of recent military-issue G10 watches. Moving on to other members of the NATO strap family, there’s the US Military (USM) strap. It’s similar to the G10 strap, but with nylon keepers instead of metal hardware. Look online, however, and you’ll find fewer references to the USM strap compared to the NATO and another closely related band, the ZULU pass-through strap. The descriptor ZULU strap (also called heavy-duty, extreme NATO, or one-piece straps) almost certainly emanates from a marketing department rather than military procurement circles. This G10-inspired band certainly isn’t an official military strap. The main difference from the NATO is in its thickness and the size of its (three or five) buckles and keepers. Even a quick online search reveals how ZULU straps were initially developed to fill a gap when other single-piece nylon band makers left the market. 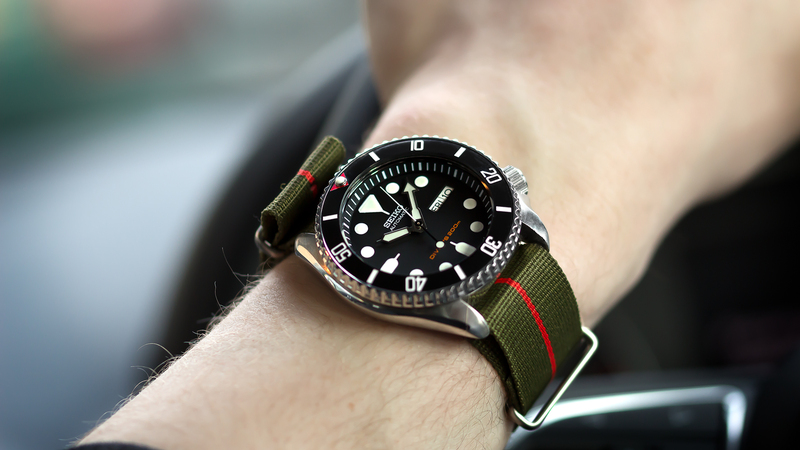 ZULUs have subsequently become popular with divers and military personnel and they’re a great accessory for anyone seeking maximum security for their watch. Both are functional, durable and secure, but ultimate performance is key when considering NATO vs. ZULU. The 2001 DEF STAN references straps for RAF use (NSN 6645-99-527-7059). These are usually simple one-piece pass-through bands without extra hardware or secondary straps – most likely due to the watches being worn with a leather pad (or ‘bund’) behind the watch casing (the original bund straps were introduced by the Luftwaffe in the 1960s). Depending on the source of reference, the RAF watch's keeper is made of the strap material or, where there's a bund, metal like the standard G10 (NATO) to Def Stan 66-15 and 66-47. No discussion of NATO straps would be complete without reference to Ian Fleming’s James Bond, the debate about whether Sean Connery’s watch strap in the early Bond movies was a NATO, and its colour. After years of speculation, the argument seems to have finally been resolved with the release of digitally restored versions of Dr No, From Russia with Love, Goldfinger and Thunderball. For decades, conventional wisdom was that Bond’s big-crown Rolex Submariner 6538 was on a NATO band with black and grey regimental stripes. 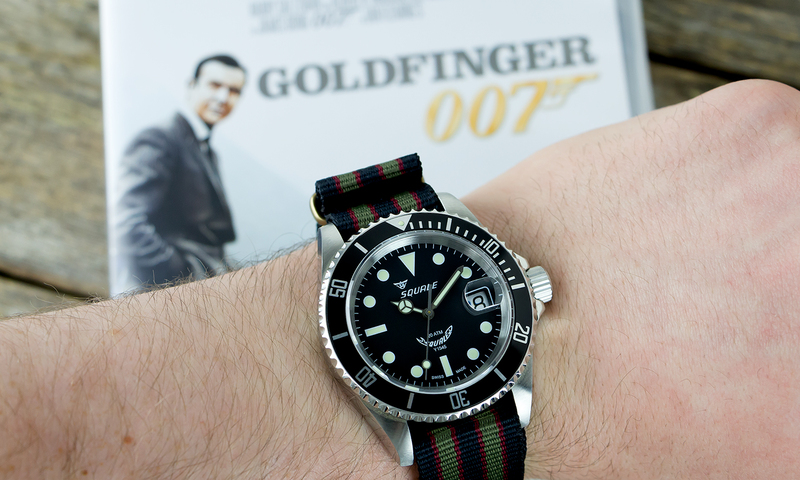 Despite the films being made a decade before publication of DEF STAN 66-15 (so the strap couldn’t have been an official G10 or NATO) it subsequently became known as the ‘Bond NATO’ among watch enthusiasts and 007 fans. Some commentators believe the colours on Bond’s strap are those of the General Service Corps or Royal Navy Volunteer Reserve (Bond was, of course, a retired naval commander). Others, that they’re from the Royal Artillery Golfing Society or Albert ‘Cubby’ Broccoli’s London club. Supposedly, Broccoli loaned the watch to Connery for filming Dr. No, his first Bond movie, when production budget limitations precluded buying a Rolex – and the Swiss manufacturer wouldn’t provide one for product placement. Whatever the truth, the watch and strap combination remained with Connery for several films. Close analysis of both during several close-ups in Goldfinger is revealing. Even before film restoration, it’s clear that Bond’s strap is less than 20 mm wide. Estimates put it at a spring-bar-revealing 16 mm due to lack of a suitably wide over-and-under cloth strap for the Sub’s 20 mm lugs. 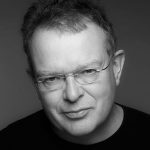 Suggestion that the strap was a hurriedly-purchased 16 mm nylon ‘dime store’ strap (to fit Connery’s larger wrist) sits well with the aforementioned Cubby Broccoli theory – especially given that 16 mm straps were ubiquitous in the early 1960s. Whatever its origin, rather than five black and grey stripes, we can now see that the strap actually had nine stripes in navy blue, olive and burgundy. If you want to see for yourself, here are locations for two good close-ups during the explosive pre-title sequence of Goldfinger. At 01:59, you can clearly see the Rolex worn over Bond’s wetsuit sleeve. At normal viewing levels, the strap looks black and grey, but zoom in and you’ll see its true colours. Then, after making his escape, at 02:41 Bond lights a cigarette in a nightclub. Again, the Rolex is seen close-up and the strap colours are clearly recognisable. Jump forward 50 years to Daniel Craig in Spectre. Not only is Bond’s watch now an Omega, but it’s on an updated NATO-style strap. Again, because it’s striped and isn’t Admiralty Grey, this strap is clearly inspired by the original NATO spec rather than being a genuine military strap. Don’t even think about getting us started on the Rolex Submariner reference 6538 reputedly given to Craig by the late Broccoli’s daughter Barbara in 2008… Could it have been the original 1960s Rolex? We say listen less to the watch snobs and have the confidence to do your own thing. Style and choice is so personal. If a strap does what you want it to, who’s to say what’s right or wrong? It’s like choosing between a £50 TIMEX and a £50k Audemars Piguet – it’s your right to choose what you want. And, of course, the proof is in the choosing and wearing and we know NATOs are functional, on-trend and in demand. Whether a £15 NATO strap or ZULU band cheapens seriously-expensive luxury watches is another matter of opinion. With the subjectivity of style and taste set aside, a top concern is that the strap's quality and performance is consistent with your watch’s quality and value. The security of a strap that runs under the watch casing has definite appeal when you’re wearing the value of a small car on your wrist and lead an active life. All we’d say is that, for the sake of your credibility (and your watch’s security) you should make sure you know how to put on and wear your NATO watchstrap correctly! The NATO’s ‘military approved’ functionality and ‘tacticool’ are also important considerations. The MOD knew what it was doing when it drew up the 1973 and 2001 DEF STANs – before commissioning thousands of straps for personnel working under demanding military conditions. What was right for them then is probably right for you now. For many wearers, the classic NATO suits their contemporary watches. They’re also de rigueur to complement many vintage watches, especially if you can’t find a contemporaneous original. Note also how brands such as Omega and Bremont have recently jumped the NATO strap bandwagon – not surprisingly, at extremely high prices compared to many other strap suppliers. And of course, as several incarnations of Ian Fleming’s super-spy have shown, they also work well with classic Subs and Seamasters. If the NATO was (and is) good enough for James Bond, need we say more? Will a NATO band cheapen you? Does a Seamaster with NATO strap look wrong? As a final thought, please consider the range of military types who’ve worn NATOs in action. Will you be the person who tells a seasoned special forces operative that his or her G10 strap cheapens them? If so, then after you… Or maybe you’d rather visit our NATO strap section and get on-trend with one of our practical, inexpensive, stylish NATO, ZULU or USM bands. Love this article. Please let me know when you guys widen the center stripe on your vintage bond. I would absolutely adore that. ???? Good article. I don't think that many people know this. The truth is that in the 80s, when I was in the army digital watches were all the rage and an old fashioned wind up on a grey strap wasn't much sought after. Now the problem I have is that I would like a NATO strap that reflects my old regimental stable belt. They're available but only in 18mm and I need 24mm. Grab a new strap here!